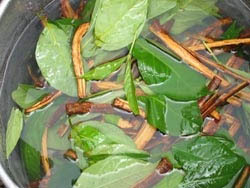 Making an ayahuasca brew is a ritual by itself that usually involves a lot of time, patience and care. For those who are nevertheless considering the option, here are some of the preparation methods to give an idea of what it involves to make ayahuasca. The required ingredients can easily be purchased online at places such as Botanical Spirit. The Shuar shamans (uwishin) split a 1- to 2-meter-long piece of Banisteriopsis caapi stem into small strips. They place the strips in a pot along with several liters of water. They then add leaves of Diplopterys cabrerana, a Herrania species, Ilex guayusa,Heliconia stricta, and an unidentified Malpighiaceae known as mukuyasku. The resulting mixture is boiled until most of the water has evaporated and a syrupy fluid remains. The Kamsá, Inga, and Secoya make similar preparations. The use of Banisteriopsis caapi in this recipe is based on the premise that a) a brew of B. caapi and (usually) P. viridis is the traditional South American brew, b) the caapi is particularly important as traditionally the caapi itself is considered to be “ayahuasca” while the DMT-containing plants are simply helpers, and c) the caapi and the experience it provides are smoother, safer, and “wiser” than that produced by Peganum harmala (syrian rue). B. caapi is less unpredictable and more controlled, a more reliable and learned teacher. Wrap the caapi in a towel and break it up with a hammer until it is shredded. Powder the mimosa with a coffee grinder or shred by hand. In one pot, put in the mimosa, a teaspoon of vinegar, and a liter or so of water. In another pot, put in the caapi, and a similar amount of water and vinegar. Simmer for 2-3 hours or until water level gets low. Avoid boiling — it should be just cool enough not to bubble. Speak your intentions to the brew as it is brewing; listen to the sounds it makes. Do not leave it unattended; if you need to do something different, turn off the stove. Keeping the mimosa and the caapi separate, filter each through a cloth (e.g. a t-shirt) until the brew becomes clear, probably 4 or 5 times. (An excellent method for easy filtering is to duct tape a t-shirt over an empty pot, allowing you both hands to pour the brew. The t-shirt will become quickly clogged, so for each filter you must use a fresh section of cloth.) Put the mimosa tea in a pot for mimosa, the caapi in a pot for caapi, and reduce both; remember not to bring to a full boil. Repeat steps 2-5 three times, keeping the mimosa and caapi separate. The plant material is to be boiled a total of three times with fresh water and vinegar each time; the brewed/filtered tea is kept separate and reduced over low heat as you do the second and third washes. This method requires four pots, unless you spread it out over several nights. At this point you will have a pot containing the three washes of mimosa, reduced, and the same for the caapi. Each dose should be no smaller than half a cup and no larger than a cup. (Less concentrated brews taste better, but leave you with more to drink.) Put them in the fridge overnight. The next day, carefully remove the cooled mimosa from the fridge. Through a t-shirt filter, pour off the liquid; avoid disturbing the sludge/sediment on the bottom of the container. You don’t need it. DO NOT do this with the reduced caapi brew; if you’ve filtered properly, your tea should be pretty clean. It should become clear when heated, and have a purplish color, much like red wine. Once you have done this, you have the option of combining the mimosa and the caapi or drinking the mimosa after the caapi. Shake up the caapi to make sure that any sediment is in the tea and not on the bottom of the container. Heat up the tea, drinking it warm. It is suggested that two doses be brewed for each person. If you cannot keep the tea down and purge prematurely, you will then have another cup to drink. Be thankful for the experience, no matter what happens. There are always lessons to be learned, whether it “works” or not, whether you have a “good” trip or a “bad” one. This is a bit more complex than some recipes that call for syrian rue, but using real vine instead of syrian rue is worth it. It is a bit more expensive, but worth the money; even with B. caapi, a dose will still cost less than many other hallucinogens. Note 1 – Fifty grams of P. viridis leaves can be used instead of mimosa. If going this route, the completed washes should be put in a container or pot in the fridge until the next day instead of being reduced immediately. Note 2 – Make sure your pots are steel — no aluminum and ABSOLUTELY no Teflon. After finishing a wash (step five), you can reduce the brewed tea while doing the remaining washes; however, if you do not have four pots, it is possible to do it all in one pot. The caapi and mimosa can be combined into one pot throughout the brewing and reduction process. If you are doing it like this, you must spread out the brewing over more than one night; the reduction must be done AFTER the sediment settles overnight in the fridge, as in step eight. You can reduce the mimosa and then pour off the sediment after letting it sit in the fridge without it affecting the quality of your tea; you cannot do this with caapi. Note 3 – Storing your ayahuasca brew. After preparing, ayahuasca can be stored for several weeks, if not months. Make sure the brew is stored in well sealed pots/containers and in a dark, cool place. Always boil the ayahuasca again before drinking it. This recipe circulates on the web and was probably developed from recipes used in Ecuador and northern Peru. 50 grams fresh B. caapi vine per person. 85 grams fresh P. viridis leaves per person. The ayahuasca vine is thoroughly crushed and placed between alternate layers of P. viridis leaves in a stainless-steel or earthenware pot, and covered with water. The brew is gently boiled for 4 hours. The liquid is poured off and collected. Using the same plant matter, the pot is filled again with fresh water, and gently boiled for a further 4 hours. The liquid is again poured off and collected. The plant matter is now discarded. Both quantities of liquid are combined and boiled gently for to concentrate the ayahuasca, until a managable amount is left for each dose. While the evaporation and concentration is taking place, care should be taken to ensure the ayahuasca is not boiled too vigorously, as this will cause degradation of the active ingredients and will also cause caramelisation of the contained sugars, resulting in a very thick final brew.